This is Jeff Kelley of Newworld Grid. He is the rocking inventor of the first Multiple Avatar Hypergate, and that’s a big deal for reasons that should be obvious (*whistles and pretends she knows*). OK, I kind of know – we all get to travel together! I call shotgun! The HGAC (yeah, try not to confuse it with HVAC, all these acronyms, I was in America for 5 years before I found out that a CPA is not some sort of first-aider)… anyway the Hypergrid Adventurer’s Club met today. There was the usual 30 minutes of mad chat in which all the educators and devs tell their latest news – a sort of technical/verbal version of PiRat’s Art Kahos, too much happening at once, I never know what the heck is going on. Pathfinder Lester puts a chatlog on his blog, so look for enlightenment there. I did learn that, apparently, there’s a sort of ‘suitcase’ now. Content-paranoiacs everywhere fear that if they go into someone else’s sim-on-a-stick, that sim owner is going to steal all their goodies – it is technically possible, and the suitcase (it’s a crocodile-skin folder, I hope) is supposed to protect your stuff. Except it doesn’t work – well, not yet. Another work in progress. It’s a lot of fuss about nothing – feel free to steal my hair. Know my pain. Apart from his taste in evil penguins, he is a brilliant guy, Jeff. 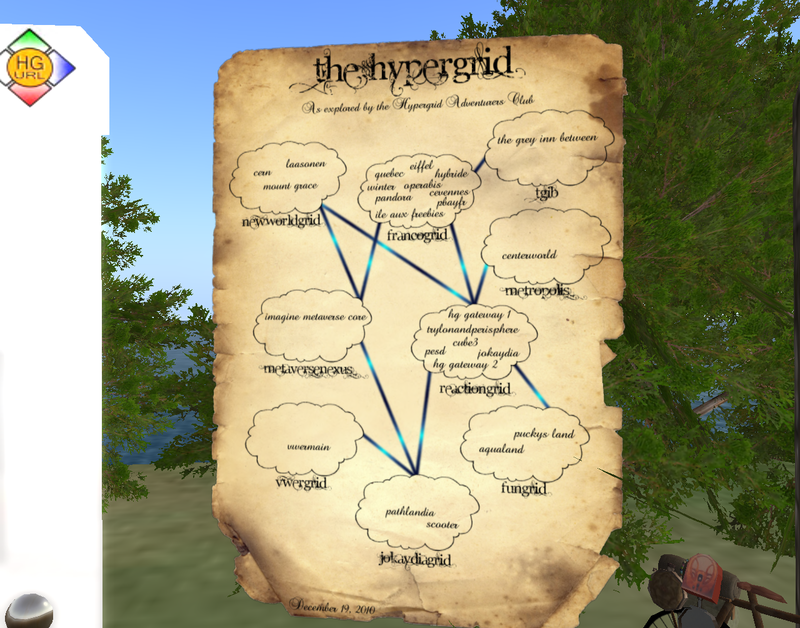 Look at this – he has set up a 12 frame powerpoint spelling out the whole hypergrid jumping thing. Here are the highlights. Apparently there are hippos at large in OSGrid also. I hope those hippos don’t do unnatural things to the poor hamster. There are several different ways to use a hypergate (or blamgate, as they’re sometimes called). Some gates are set to a particular destination, and you just walk through to get there. Some offer a menu when you touch them, or a link to thehypergates.com. But you can also just stand near the gate and open your Map, and copy your destination into the Search feature of your Map, and when it finds it, hit TP… I like the club because Path holds all our hands, so we don’t get lost. Or not very lost, anyway. We did take a detour to TGIB, but it was nice in the woods. The best bit is the lovely map showing the HGAC’s explorations so far. They can’t get to Craft yet, it’s on a different system or something, but when they do, I plan to have the coffee and sherry ready on Arts Park. What do hamsters drink, anyway? This entry was posted in Travel and tagged artsparks, hgac, jack kelley, pathfinder lester. Bookmark the permalink.